After a major 1.2 release which included mobile palette based on jQuery Mobile components, we pushed a minor 1.2.2 update mostly with bug fixing and other improvements. One important update in 1.2.2 is that collaboration now works behind any firewall. Before this release, Appery.io used a port other than 80 for collaboration. We heard from users who are behind a firewall that collaboration just didn’t work for them. We updated Appery.io collaboration to work with port 80 so now everyone will have this feature working. Give it a try and let us know what you think. There are multiple ways to share a Appery.io prototype project. One of the first features in Appery.io was collaboration. During prototype design you can invite anyone to collaborate with you on the prototype in real time. You can invite a colleague working from home or a remote team in another country. There is a even a chat feature. Another way to share is to send a link to the Web Preview of the prototype. This is great if you want to show how the prototype looks in a web browser to a customer. We recently launched another way to share the prototype (the old school way). 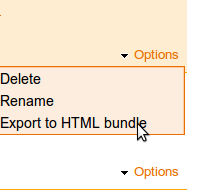 You can export the entire project into a zipped HTML bundle file and then share the file. Web Preview version (HTML/JS/CSS) will be generated for each screen in prototype and zipped together.